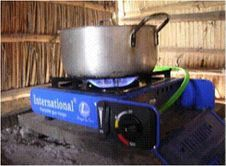 The technology is simple and cheapest among other models. The average cost of materials is currently around 150USD. 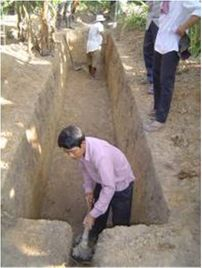 This is a 5 to 8 cubic meter biodigester installed by plastic tube put into a well-prepared pit on the ground. 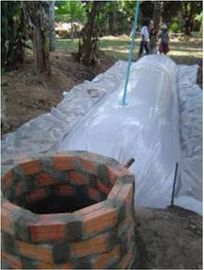 The popular size of plastic tube diameter is 1.6m to 2m and the length depending on the size of family and resources to use a biodigester, normally 6m to 8m in length. 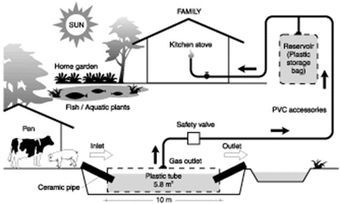 The waste inlet is put at higher level than outlet, approximately 1% slope (as showed in the picture diagram below) and the plastic tank was connected by 21mm diameter PVC tube and linked to the gas reservoir before connected to gas burners. The fresh waste/manure is mixed with water which drains into in a plastic barrel that was dug on the ground. In the process, methane gas is produced within 20 to 30days. And this model normally lasted between 1 to 3 years depending on maintenance. The model is a fixed dome individual (household) biodigesters designed by National Biodigester Program (NBP) based on Deebandoo model from India. The plant is constructed with local materials, bricks, sand, and cement and has an estimated lifetime of 20 years. 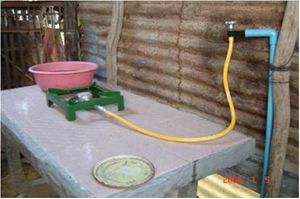 The technology is suitable for both pig and cattle dung, and households are encouraged (but not forced) to connect a latrine. The total size is ranging from 4m3 to 15m3 depending on family size and resource available. While the material cost is increasing, and average cost of each plant, refer to 4m3, is currently up to 450 USD per plant, and even higher cost of a completed construction in some remote provinces where the construction materials are expensive. The technology is very popular in the provinces around Phnom Penh city as the materials are easy to access by in-land transportation, especially bricks. 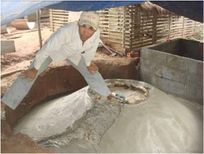 This biogas plant is a simple fixed dome, cone concrete biodigester, and the last designed model. The design purpose is to make it easy for construction and sourcing of material resources normally available at the local community, especially the area where is easy to collect sand and gravel for construction. This is a family scale biodigester that produces enough gas for a family in rural area by using cow manure, pig manure and human waste (this just encourage but not force). The material construction is mainly cement, sand, gravel and bricks (not many, only 10 to 20 bricks are required). The bottom part constructed by concreted cement from a metal mold, and the top part, inlet and outlet constructed by a wooden mold. As such it is expected that this unit should last a minimum of at least 15 to 20 years. The average cost per unit is around 350$ excluding family contribution such as sand, gravel and unskilled labor. 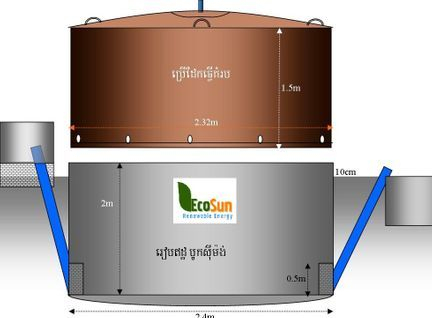 This type of plant basically comprises of an underground brick masonry digester connected with an inlet and outlet covered by a floating steel gas holder for gas collection. 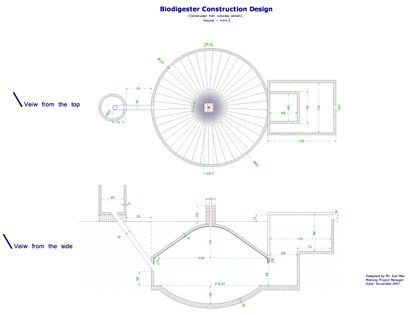 Gasholder moves up and down guided by a central guide pipe depending upon accumulation and discharge of gas. Floating gas holder made of mild steel alone accounts for some 40 percent of the total plant cost. This plant is a simple design, easy to install if compared to concrete cone or fix dome biogas, and able to install from very small scale, 2m3 up to over 40m3 for a medium farm. The gas holder is separated from the digester. A partition is provided in digester to encourage circulation. The floating gas holder provided at the top of the digester helps to keep the pressure constant. The gas holder rises when the pressure is increased due to production of gas and allows the generated gas to let out through the gas supply pipe. 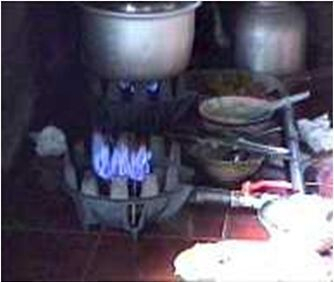 It lowers when pressure is decreased to stop the supply of the biogas.